The hands of Acharya Rajneesh (1931-1990), the man who called himself Bhagwan, and then later Osho, tell us of the weaknesses as well as the strengths of his character. While his hands show a personality with laudable traits, they also reveal a dark side to his disposition. There have been accusations against him, that he was a phoney, and then there are those who swear by him and believe that he was indeed God on earth. The truth lies somewhere in between. This post will explore what Rajneesh was like in real life. If one concentrates on the remarkable side of his nature, then what stands out is that he was a thinker. The shape of his hand and fingers, the finger phalanges, as well as his Head Line, tell us that he was not an ordinary thinker but an extraordinarily original one who observed life around him very keenly and found explanations and solutions. would constantly be on the go and could easily infect others with its enthusiasm and strong beliefs. See a photo of his hand here and here. His magnetic persona is clearly evident from his Mount of Venus and Heart Line. When this aspect of his personality is combined with the wisdom shown by a strong Saturn finger you have a person who can inspire and lead others on a spiritual path. The shape of his fingers and their position, particularly the finger of Jupiter, shows that he was the kind who was very independent in his views and cared little for what others or society thought. It is not surprising that Osho tried to found a religion or cult and some would say he was successful. His thumb and Jupiter finger show leadership qualities like determination, a strong will and the ability to command others. His Mars tells us that he was mentally strong and aggressive. Rajneesh was strong-headed to a fault, shown by his thumb and Head Line. It is important to remember however that this did not mean that he did not listen to others. The shape of his thumb shows that he could be carried away and influenced by those who felt were worthy of his trust. More on this aspect of his character later. His Venus and Heart Line shows that he had plenty of love and compassion to give but it was a limited love, reserved for those he thought were worthy and this is clear from the shape of his hand. To be fair to him, this by itself is not a bad trait in itself and most of us are like this. In fact, a lot of us may not even have the tremendous love this man had to give. In a spiritual person, however, one expects more. Rajneesh lacked the humanitarian kind of love, a love for all humanity irrespective of who they are, and this is probably one of the reasons why his band became known as a cult. This is shown by the placement of his thumb as well as the overall shape of his hand. The desire to reach out and help those who are suffering, the humanitarian attitude, is evident in the hands of other spiritual leaders like Baba Ramdev, Sri Sri Ravi Shankar and the Sai Baba of Shirdi. Another trait of Osho's, evident in the shape of his hand, is his suspicious nature. He would not find it easy to trust people in general. His Mount of Venus, Mount of Moon and Heart Line if read in combination show well developed sexual passions. His Mount of Moon is highly developed but unfortunately, it shows that Osho has more of the negative qualities of this Mount rather than the positive. It shows an unhealthy imagination, thinking the worst of others. The shape of his hand and phalanges, thumb and Jupiter finger when read in combination show something quite disturbing - a despotic makeup. His character was such that he needed power and attention to an extreme degree. In that sense, balance was missing. This trait is missing from his left or dormant hand. The right hand (if you write with your right hand) is the active hand, and tells you of the current state of mind. Osho was right-handed. His left hand or dormant hand does show a desire for power and fame but this desire is in normal proportions. He changed, and anyone familiar with Rajneesh's life will probably be able to tell when this happened. The end result is that Osho became a person obsessed with power to an abnormal degree. His Jupiter finger position and shape shows that he would do anything to maintain it. His innate shrewdness and tendency to manipulate people always did exist and this was enhanced as well. Osho's hand gives us some clues as to why and how he changed. His sudden elevation to a high status could have played a part because as they say power corrupts. And possibly his innate suspiciousness and reluctance to trust people in general could have kept him isolated. On the other hand, his thumb shows that he could be carried away and influenced. He was of an impressionable nature. His thumb, Jupiter finger, Jupiter phalanges, and the Moon Mount tells us that he was a dreamer and if he wanted to build an empire (which he desperately wanted to do) he would have to have someone else to do it for him. He lacked the consistency that execution of plans requires, and as his Jupiter finger shows, he personally may not even have wanted the responsibility. My reading is that had he been more trusting, with more integrity and less impressionability, he could have retained the original balance of personality. His basic nature shows him to be someone with an extraordinary ability, and it shows him to be a good man at heart. Something changed along the way. Or check out the hand readings of Spiritual Leaders from around the world. Thanks for publishing another fascinating study. I'm really enjoying reading these analysis of yours and I think I maybe developing a better understanding of palmistry thanks to you. Thanks TT. Appreciate your coming here and leaving a comment. I too find it fascinating to delve into the minds of people. It is exhausting in a way because when one sees a hand one literally enters into the mind of the person! Pity how power can eat away other good things..
yeah, power can corrupt the weak. Very interesting hand reading. It really explains a lot when it comes to Osho and everything that happened. Please can you post a clear picture of Osho's hand? There are many good photos of Osho on the web but I cannot post them here as I do not want to violate copyright. As far as possible I use Picapp pics, which are free. You can easily find good pictures of Osho's hand. Just search for them on the web. How can you say that power corrusped Osho... what events or happenings are you relating it to.. Anonymous, I have very little knowledge of his life. My analysis is based purely on his hand, particularly the way his hand changed. His hand shows a lack of balance and the balance was altered because of his need for power. As I said, this is what I read on his hand. u may notice that his finger near to thumb do not touch to the middle finger. There is gap between middle finger and the finger next to thumb . What it indicates ? I have seen his hand photo on orkut community every where i found this feature. Even u may find it in photo posted by u on this link. atul, what you said is right. There is a distinct gap between his index and middle finger. This indicates independent thinking and people with this sign are usually think without being influenced by others. But this sign needs to be read with caution. The tips of the fingers and that of the thumb need to be taken into consideration to confirm this reading because tips can show impressionability. Also. this sign can become an extreme one and for this one has to take into account the head line. When I read a hand I take into account all the signs and balance out the reading. "You are looking at Osho's hands from all that you hv learnt about palmistry.You are looking at it from colored glasses." Each and every hand reading on this blog is from the point of view of palmistry. I have no intention of trying to get to know the 90 people here (all the people I have analysed) personally. Soon this 90 will become a hundred and then a thousand. I have no intention of getting to know anyone of these famous people, not even those whose hands I admire. This blog is from the point of view of palmistry only. Take it or leave it. could you do a reading for Sadhguru Jaggi Vasudev? He sort of reminds me of Osho as a rising figure in the spiritual world. I want to know if you find anything up his sleeve now that he is becoming more and more famous. Anonymous, I shall look for photos of his hand. I love reading hands of spiritual gurus. Interesting reading from a hands of a living Buddha. Honestly, I know much of Osho and his life history, so most of the described Osho's characteristics here are true. Although I can't understand why Nita put some of his characteristics in a section "Not so pleasant", I can't find anything not so pleasant in his so called despotic behavior. True that he wanted power and appeared a little bit despotic but for what? Is it for the sake of power itself? Or it was for his people and beloved disciples. In this world ruled by people who want power, and who have been on Osho's tail since the beginning of his Masterhood, one will do anything to defend his work and people, with non-compromising attitude. After all the rose has thorns as well, but should we put these thorns in a "Not so pleasant" section and consider them as something bad? I can understand why Nita has such interpretation of Osho, but sometimes things are not like it appears to be on a first look, sometimes deeper understanding is needed for the truth. If he was despot and ruler on the back of the disciples, manipulating them, then why did he attracted so many of them, and most of them were with him the whole time, never leaving him. Your posts are quite interesting :) I have read a few of them. Suspicion arises, though, on the genuineness of your analysis. I think it's natural. 2. My fate line ends with a fork between the middle and the ring finger. Does that mean I'll, most probably, get imprisoned sometime? The first question I ask 'coz I started meditation a few years back, and life has taken a drastic turn post that. Since meditation is the art of dropping your past (and, hence, the future too) to remain in the NOW, don't you think the lines don't hold much value then? PS: I am always startled by the fact that Osho's dad was one of his sannyassins. It's like a father working as an employee at a company set-up by his child. Very unusual. Sure, there will be sceptics, what can I say? I guess only a personal hand reading will convince them. About the link, it does not work. In any case I cannot understand that line you quoted from Osho. If you notice on my blog I use simple language and simple ideas. No mysterious and esoteric words. In any case palmistry/hand reading can never tell the future with any accuracy and therefore to me the sentence from Osho is as nonsensical as it sounds. About that fork on your hand, let me assure you that the future cannot be told through hand reading, only very general trends can be deciphered, and these too can change. Also, (and this I have said several times on my blog) signs like forks, and tridents are meaningless. You have to see where the line ends, where it begins, the strength of the line before and after the fork, the strength of the complete line, the strength of the sun line (the sun and fate lines are related) and so on. I can never understand the remaining in the now advise that spiritual gurus give. I think it is meant for people who over-anxious, and perhaps disturbed. An effective personality will think of his past and learn from it. He will think of the future and plan for it. He will do this without worrying and beating himself up. He will take action in the present (the now) and do it will complete focus. We do not have a fixed destiny. Remember we make our life as we go and our changing lines reflect that. However hand reading can help you understand yourself and the choices you have made in the past and help you make the right choices in the future whether or not you have made them in the past. Hand reading analysis also delves deep into the various layers of one’s personality and makes one understand whether one is are on the right path in one’s career and personal life. Hand reading is not about fortune telling as you will realise if you read the various articles on my blog. Thanks for your reply Nita :) Really appreciate! About the link, I'll give it again at the bottom, maybe it works this time. And I completely agree with you on all you say about palmistry helping in highlighting one's character, skills, and personality, thus helping one to pursue the right path (personally and professionally) rather than trying out several wrong ones and wasting a lot of time and effort. I am not sure, but I believe palmistry is quite accurate that ways. But, there remains a 'maybe' of course. About staying in the Now, I don't agree at all with you. The spiritual message is not just for over-anxious, its for everyone. Well, of course, NOW is all we have, yet the majority lives either in the past or in the future. It's not philosophical, its quite logical. We miss the miracle of life that surrounds us. Every particle. Its really more of an experience. Hence any effort to explain is useless. Hah, and there are only a few people who really know the art of being in the Now. It really is worth experimenting with. Raghotam, I went through that link. But frankly I guess I may not be of the spiritual type because I cannot get this concept of forgetting the past. A person who forgets his past is doomed to repeat it. I remember vaguely that a famous philosopher George Santayana said something like that and I believe firmly in that. In any case I find that note by Osho very confusing, and a play with words. That is what one has to beware of because many gurus play with words. One should not forget the past. What is important is not being anxious about the past. Or about the future. Living in the present comes naturally to people who are not anxious. That is what I believe. The most effective people never forget the past. They learn from it. Also, the future cannot be predicted. Clearly Osho has fallen prey to the common belief held in the eyes of the public. That palmistry is fortune telling. I am not blaming him for that as even today most people associate hand reading with fortune telling. And what does he mean that "future is a projection of the past? "If you analyse that sentence it makes no sense! What he perhaps means is that if a person does not change he will make the same mistakes again and again. That is the correct way of saying it. It is common sense and one does not need a guru to know that. If one has had a sad life then there is something in the way the person is reacting to circumstances that has created the problem. The main requirement is to change and hand reading can pinpoint where he can do that. I understand your 'understanding' of the past-now-future thing. But, it's not like one should keep forgetting his past in order to remain in the present. But, it's more concerned with the fact that as we grow up, we gradually reduce the 'wonder', 'amazement', and 'aha' moments in our life. That wonder you can see in a child's eyes and his questions. The past is useful in the sense that you need to learn from it. Picasso painted for 30 years and kept on improving with each work of art. His past was useful. He always had the opinion that his 'current' work-in-progress art is the best he made till that date. But, at the same time he did not allow his 'past' judgments affect his work. You see the portraits made by him? It doesn't represent a woman. The people he painted used to be surprised and confused to see themselves. He saw something which was absolutely fresh. Bob Dylan says: "I define nothing.. I take each thing as it is, without prior rules about how it should be." Same is true with Steve Jobs, Leonardo da Vinci, Einstein, the 12-year old kid who discovered the concept of TV, and a lot more. And, these are the people, who are few, of course. Coz these are the people who somehow managed to protect the 'child' in them. Steve Jobs says in his Biography: "They (the school) came close to really beating any curiosity out of me". The past is ultimately useful. If we intentionally try to forget how to drive a car, and each time try to learn it again, it's stupid. The past serves the purpose of making things easy for us. Dancing, cooking, driving, drinking water, chewing food even, etc. Everything needs past learning to improve each time. But, unfortunately, that becomes our way of life. In a very subtle way, it doesn't allow us to see things 'as they are'. We see what we expect to see. We paint everything with the color of our past experience. Just by dropping this habit, the 'wonder' comes. I say this by experience. Trees get more green, sky more blue, you see unconnected things connect. All that they (spiritual gurus) say is, in my opinion, that one should be "able" to drop the past when required and use it when required. Past is good to lead a mechanical life. For a creative and constantly ecstatic life, dropping the past is utterly essential. It's the first and only requirement. It's hard to understand something this complex in such a few words, probably. So, I would just suggest that read some stuff from Eckhart Tolle, Osho, or someone of their domain, with an open mind, try to understand the same stuff from different perspectives. Better still, you can try a day or two's meditation sessions at Art of Living, or Osho, etc. It certainly can't harm. At the most you may find them useless (which I am quite certain you won't). But, if you go with a prior 'judgment' that these (spiritual) gurus try to somehow entangle you in their words, then there's a good chance that everything they tell you, you find a loop hole. PS: Even while typing this stuff, I used my past experience of Typing, so my good speed, or else it would have taken me hours to write the same. So, past is utterly essential to save us our energy. And, the future to have big goals. But, we should know how to come back and live with the amazement of a child. Thank you for taking the time to comment Raghotam. When I talk of the past, I am not talking of learned skills. I am sure you know what I mean. I am talking of behavior. And I do understand how the creative mind works, being a creative person myself. The mind has to be free. Not free of the past, but just free. Calm, peaceful, concentrating on the work, totally involved so that nothing exists except the work. One has to let go, again not of the past, but the shackles of the mind, break the borders and cast aside judgment. I will find it difficult to explain it to you but if you are a creative person yourself you will immediately understand it. And I assure you I am well aware now what gurus tell you. I prefer to see the same from reading the Bhagwat Gita. I have also read a lot of philosophers, right from Lin Yutang onwards. I have also read Eckhart Tolle. Didn't he write the Power of Now? And what make you assume I have never mediated? :) I also do yoga on a regular basis. Gurus may not my cup of tea, but I see some good in some of them. There are some who are absolutely divine, like the older Sai Baba. I can see it on his hand. I am not asking you to believe in hand reading, but I believe it a hundred percent. I respect your judgement. Whatever suits one the best. Bhagwat Gita or Buddha, I don't think it matters much. If one can live 'through' it, 'experience' the same things, instead of 'following' and 'believing' them, then its not stupid. Also, your creativity reflects via your website, without a doubt. All possible dimensions about palm-reading can be found in here, somewhere or the other, I observe. I will let you know when I decide to get my hand analyzed, which will be sometime soon, i suppose. He was a great soul that shows a true path of living consciously and happily. Your comment was published a little late Ravinder. I was checking my spam folder today and found it there. I have no idea as to how it got there! Anyway, thank you for your comment. I agree that no one is perfect and only God is perfect. Those who think that men and women are perfect are into hero worship, and not objective analysis. Not at all. One has to try and find the signs on the hand that match with known personality traits. And when one doesn't it can be very confusing. 99% of the hands I read during my practice are of unknown people and many of them I have not even met. One can be easily objective, one does not have to struggle to be so. What exactly is hand reading? A curious question though! I always thought they are fold marks developed over years of evolution. Che, people not familiar with hand reading have this idea, that the lines could be result of folding the hands. Even with the theory of evolution, every body part has a function and so do the lines. They are the window to our soul. No one person has the same lines or fingerprints. Each of us is an individual. Great job nita..! You have got a great skill and knowledge in reading palm..! in fact it is hard to predict palm like osho's bcoz he was very uncertain to himself..kudos nita..! nice work..! i make a humble request to you to write on palm reading of paramahansa yogananda and our beloved prime minister narendra modi too.. I have written about Modi, some years back, in 2009, after someone had asked me to tell him whether he could possibly be involved in the Gujarat riots. I am always interested in reading the hands of gurus and godmen to find out if they are genuine, and usually if the hand photos are available I do it. Unfortunately I do not have any of paramahansa yogananda although I have tried. If you have, then please send them across! When it comes to your private hand reading, my email id is blog(dot)nita(at)gmail(dot)com. Once you write to me, I will send you a list of readings available and the charges for the different types of readings. No matter how his life eventually became, when I had met him only once in 1977, he saved my life. I was hurt very badly by robbers and was "watching" myself leave my body on the street in Pune. He appeared right smack within and without me, saying, " come back. It's not time for you to go." Though already I was aeons away, upon seeing and hearing him, instantly I made the effort and returned to this life. He owed me nothing, yet came to save me, astrally, if you will. I will never forget this and love him dearly for it. He understood me like a true father. Beyond words and yet with words, too. He was the very essence of an educator. He was full of grace. None of his currently "powerful disciples" know what he did for me, a no one. As the Internet is anonymous, I just had the feeling that you might enjoy hearing this, Nita. He made a miracle happen to me and was kind enough never to say a word about it to anyone else. My right hand hit into the road, as did my head and shoulder, which was dislocated. The head injury was the most grave. The only cut on my entire body made a slight scar at the end of my lifeline nearest to the wrist. (I'm ambidextrous, but write with the left hand.) I enjoy your work very much. 1. I read somewhere that when the headline is attached for too long with the lifeline (as in Osho's case here), it usually goes sloping towards the Moon mount. Here it goes straight on. Does this indicate the original thinking that you deduced in your article? 2. The thumb shows impressionability as you said but in another article you mentioned that Swami Nithyanada's thumb showed a weak character with a lack of self control - is this the same for Osho as I realize both thumbs are quite similar looking. Please correct if I'm wrong. I look forward to your answers and I love the articles you post on this site. With reference to your questions, the thumbs of Rajneesh and Nithyananda are completely different. It is important to study dozens of photos because how the thumb looks depends on the angle of the photo and the way the hand is held. Rajneesh has a long, beautiful shaped thumb. Nithyananda has an average thumb. Regarding the headline how it starts has absolutely nothing to do when it ends. Remember all sorts of things on Palmistry are written not just on palmistry sites and blogs, but in books too. 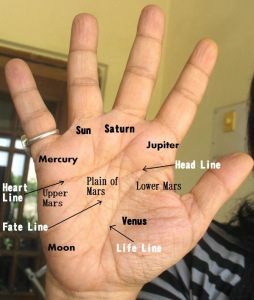 Palmistry or Hand Reading is a field where there are no set rules and nor is it recognised as a subject in reputed universities. As a result people write anything. You need to use your judgement and your own experience regarding this field. Nita, thank you so much for your clarification. One last question. I noticed his life line and his head line are attached for a tremendous amount of time. What do you make of it? Generally speaking if the head and lifelines are joint considerably at the start it means a more introverted nature in the early years of the life.